HAMPTON, Va. (July 25, 2018) — Several students and one professor from Hampton University’s Department of Biological Sciences were invited to learn about future career opportunities in the medical field, and to present scientific posters at the Mayo Clinic IMPACT Symposium in Rochester, MN this past March. During the trip, Hampton University students were able to spend three days at Mayo Clinic and receive laboratory tours, attend meetings with future research mentors, and have recruitment discussions with directors of several key programs of interest to both continuing and graduating students to help guide these students and help them decide what avenues to pursue for their future careers. “This excursion was such a great opportunity for our Hampton University students to be able to meet and interact with leaders in the field these students want to pursue,” said Hampton University President Dr. William R. Harvey. During their time in Minnesota, pre-med students Brianne Jennings, Kayla Deschepper, DeJuana Coleman, Najah Lewter, and Maissa Signate met with the director of the Stem Cell Innovation Laboratory, and toured the laboratory facilities at the St. Mary’s campus and Medical Sciences Building. Dr. Eric Lewallen, Assistant Professor for the Hampton University Biological Sciences Department, accompanied the students on the trip. Students were then provided the opportunity to meet with a senior consultant of the Destination Medical Center/Discovery Square project, which aims to expand the workforce in Rochester by nearly 30,000 employees in the fields of biomedical science and health care services by 2030. This initiative promises to provide numerous opportunities for graduating seniors from Hampton University who are interested in the intersection between business and biomedical science. In particular, the students and consultants strategized about the possibility of creating a 6-month internship program at Hampton University that would allow students to interact with world leaders in the development of novel biomedical devices. During the last day of the trip, the students attended The IMPACT Symposium, which was focused on student-generated hypothesis building for the treatment of Hypoplastic Left Heart Syndrome (HLHS), an under-development of the left heart that increases infant mortality. 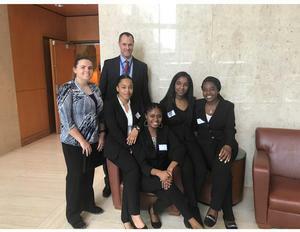 Hampton University students presented two posters, entered a competition among more than 100 peers from throughout Minnesota, and attended 10 lectures on the topic. Following the symposium, students were invited to interact with the director of the Mayo Graduate School to gain advice on the best strategies for developing a research career at Mayo Clinic or elsewhere. As a future expansion of this program, Dr. Lewallen hopes to generate external governmental funds to allow additional students from Hampton University to visit Mayo Clinic and attend similar symposia/workshops and conferences at Mayo Clinic and other tier-one research institutions and hospitals.